The organization and format of this text has been carefully developed to assist learning and retention of the material. Featuring review exercises and more than 500 review questions with rationales, students can test their knowledge, monitor their progress, and identify problem areas. The multiple learning tools and turn-key Instructor Resources significantly help reduce instructor workload. 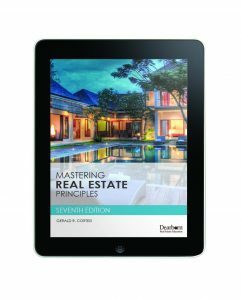 Students will benefit from an outline format that makes it easy to master the basics necessary to pass the real estate licensing exam.